Whilst jazz biographies, apart from a few notable exceptions, rarely constitute compelling literature in terms that would excite the interest of a general readership - the lives of jazz musicians being fairly mundane unless set in the context of eventful social or historical narratives - they can be the equivalent of sacred text to the dedicated follower of a particular artist and a useful reference for the record collector. 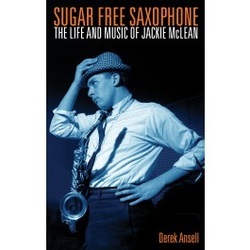 What makes Derek Ansell’s biography so valuable is that nearly everything that has hitherto been written about hard -bop altoist, Jackie McLean ( in English at least) is spread across magazine articles and interviews, sleeve notes, record reviews, general jazz histories and references in the biographies of others. Apart from a chapter devoted to McLean in A.B.Spellman’s `Four Lives in the Bebop Business` this latest volume from Ansell’s pen is, I believe, the first complete account of the musician’s story to appear in a single volume and as Spellman’s work appeared in 1966 (with a reprint and new introduction in 1988) it is the most up to date appraisal of the artists work and worth. Spellman, of course, had the advantage of being able to converse personally with McLean, as did Ken Burns whose interviews with the sax man appear in his monumental `Jazz : A Film `. Ansell relies primarily on secondary sources, the aforementioned included ,which he duly acknowledges in his notes along with the co-operation he received from Jackie’s widow and daughter, so it follows that apart from bringing everything we know about Mclean under `one roof` so to speak we don’t really learn anything that isn’t already in the public domain. This shouldn’t be construed as a weakness because the course of Jackie’s career is comprehensively plotted: his social milieu, his inspirations, early influences and veneration of Charlie Parker, his work with Miles Davis, Mingus and Art Blakey, his experience as an actor, the gradual transition from Hard Bop to Free Jazz culminating in his role as an educator and activist as well as the usual vagaries of the `jazz life`. It’s all here plus Ansell’s evaluation of his importance as an innovating musician and a review of his recorded output together with a select discography which takes in the all the `essential` discs. Ansell, in fact, rightly avers that McLean was not an innovator per se but credits him with being the creator of Hard Bop’s signature sound; that tart, rapier-like aggressiveness that identifies his unique style, itself an extension of the Parker legacy rather than a departure from it as in the case of Ornette Coleman whose playing McLean admired but never emulated even in his so called free –jazz excursions which began with `Let Freedom Ring` in 1962. Of these later` free` sessions, Ansell is fairly uncritical and it might have been interesting for the sake of variation had he commented on that body of opinion which held that recordings like `Let Freedom Ring`, `One Step Beyond` and `Destination Out` were symptomatic of McLean losing his way artistically in something of stylistic fudge. Ansell does point out, however, that McLean never wholly relinquished his allegiance to conventional hard bop whether as an insurance policy against the fickle taste of the record buying public or his own musical ambivalence and continued to play with straight ahead vigour until the end of his life in 1966. This I can confirm personally because I was in New York in 2002 when Jackie celebrated his 70th birthday with a weeklong series of gigs at the Iridium jazz club on Broadway. There I heard the great man playing spiritedly alongside his tenor sax playing son Rene and former Hartford pupil, Steve Davis on trombone with members of The Living Theatre (his thespian colleagues) in the audience helping him celebrate. A magical memory brought vividly back to life with reading of this biography which has in turn sent me back to my collection of McLean’s recordings and the need to repair the gaps with some urgency. So whether it serves to re-ignite your interest in one of the music’s most distinctive voices or starts you off in search of it you’ll find `Sugar Free Saxophone` a companionable accessory.